On the heels of the recent global summit in Paris to tackle climate disruption, the World Trade Organization (WTO) has ruled against an important piece of the climate solution puzzle: India's ambitious program to create homegrown solar energy. The ruling shows that decades-old, over-reaching trade rules are out of sync with the global challenge to transition to 100 percent clean energy. In just five years, thanks to India's National Solar Mission, India has gone from having virtually no solar capacity to boasting one of the world's fastest-growing solar industries. In just the last year, a parade of leading solar companies has announced plans to establish new factories in India to produce solar cells, the parts of solar panels that use sunlight to produce electricity. India has named the solar program as a core component of its contribution to the Paris agreement to tackle climate change. But today, the WTO released its ruling against India's National Solar Mission, deciding that India's efforts to boost local production of solar cells violated WTO rules. Though India argued that the program helps the country to meet its climate commitments under the United Nations Framework Convention on Climate Change (UNFCCC), the WTO rejected that argument. Indeed, the ruling boldly states that domestic policies seen as violating WTO rules cannot be justified on the basis that they fulfill UNFCCC or other international climate commitments. In effect, the WTO has officially asserted that antiquated trade rules trump climate imperatives. To understand the importance of this case, you must first understand the progress the Indian government has made in deploying solar energy. In the five years since India announced its national solar program, the country has grown its solar capacity from nearly nothing to commissioning nearly 5,000 megawatts, as a result of government subsidies and long-term contracts. As we've noted before, this solar expansion has been timely, as the troubled Indian coal industry has been unable to expand to meet power demand. The program aims to reduce the cost of solar energy and achieve 100,000 megawatts of solar power capacity by 2022 - more than the current solar capacity of the world's top five solar-producing countries combined. India also plans to use the solar program to establish "a leadership role in low-cost, high quality solar manufacturing." In January 2015, President Obama seemed to indicate support for that goal. After a visit with Indian Prime Minister Modi, the two leaders released a statement "emphasizing the critical importance of expanding clean energy research, development, manufacturing and deployment, which increases energy access and reduces greenhouse gas emissions." Their statement even declared, "the US intends to support India's [solar power] goal by enhancing cooperation on clean energy and climate change." 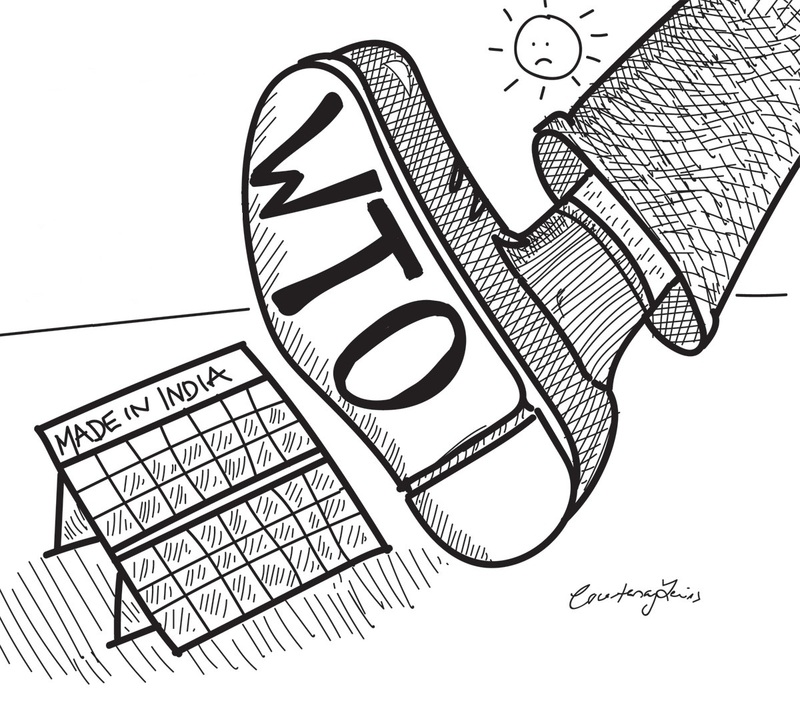 In 2014, however, the United States launched a WTO case against India's ambitious solar program. The United States claimed that the "buy-local" rules of the first phases of the program, which say that power companies must use solar components made in India in order to benefit from the government-subsidized program, discriminate against U.S. solar exports. 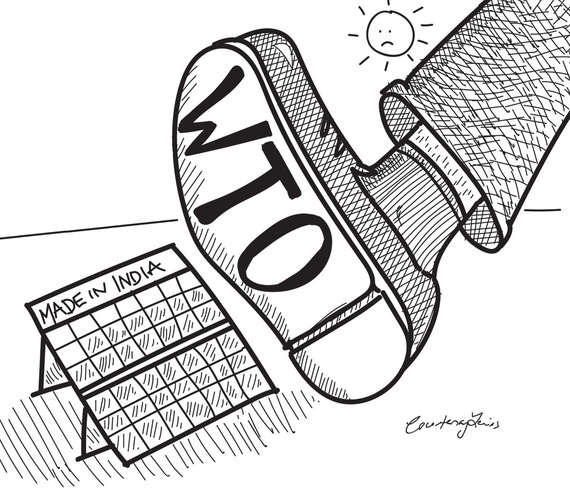 In its ruling, the WTO agreed that India's buy-local rules "accord less favorable treatment" to imported solar components, even while acknowledging that "imported cells and modules currently have a dominant share of the market for solar cells and modules in India." India has indicated that it may alter its solar program to try to persuade the U.S. to drop the case. It is unclear whether the U.S. will accept the proposed changes, and what impact they may have on India's solar expansion plans. Bringing this case is a perverse move for the United States. Nearly half of U.S. states have renewable energy programs that, like India's solar program, include "buy-local" rules that create local, green jobs and bring new solar entrepreneurs to the economy. The U.S. government should drop this case to avoid undermining jobs and climate protections not just in India, but also at home. Every country should have the right to set its own clean energy future. "Buy local" rules -- a standard policy tool to foster, nurture, and grow new industries -- can help push us toward the goal of 100 percent clean energy that our planet needs by cultivating domestic renewable energy firms that promote strong climate policies. "Buy local" policies can also benefit workers and bring in new constituencies to advocate for increased clean energy production. And by bringing more renewable energy goods producers like India to the global market, "buy-local" policies can encourage greater competition and innovation, reducing the cost of renewable energy over time. The WTO ruling against India's homegrown solar program echoes another WTO ruling in 2013 against "buy-local" provisions in a groundbreaking clean energy program in Ontario, which had successfully reduced climate-disrupting emissions while creating thousands of green jobs. Three weeks after the WTO's ruling, Ontario eliminated its "buy-local" provisions and ended incentives for large-scale clean energy projects. Rather than reform this outdated model of trade that constrains climate progress, the Trans-Pacific Partnership (TPP), a trade pact between the U.S. and 11 other Pacific Rim nations that could come before Congress this year, would expand the model. Indeed, the text of the controversial deal replicates the very rules that the WTO used against India's solar program today. While many in Congress oppose the TPP, if the deal were to pass, we could see even more trade cases against clean energy initiatives. Congress should view this ruling as further confirmation that a vote against the TPP is a vote for green jobs and climate action. You can take action now to protect job-creating clean energy programs by asking your member of Congress to vote no on the toxic TPP.